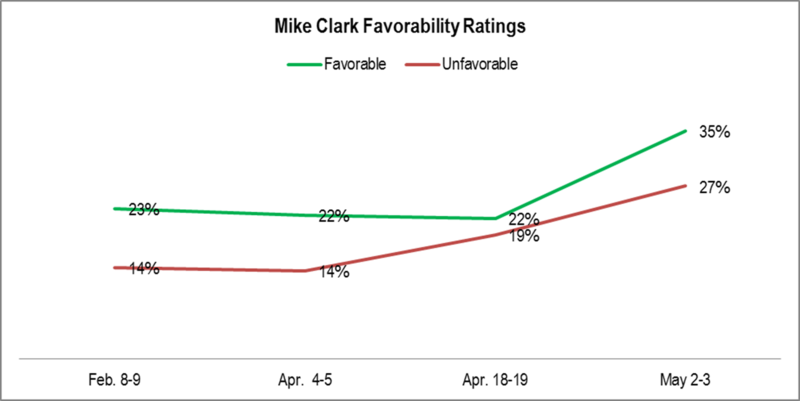 As with Mike Clark, political party was the top determinant of favorability towards Vinis. As one would also expect, given that Vinis was practically unknown at the beginning of the campaign (see: http://lindholmcompanyblog.com/?p=13040), her name familiarity steadily increased among all groups with her net favorability rocketing among Democrats. QUESTION: I am going to read the names of some people. Please tell me whether you have heard of each. IF HEARD OF … Do you have a favorable or unfavorable opinion of ______ IF FAVORABLE OR UNFAVORABLE: Is that strongly or somewhat? 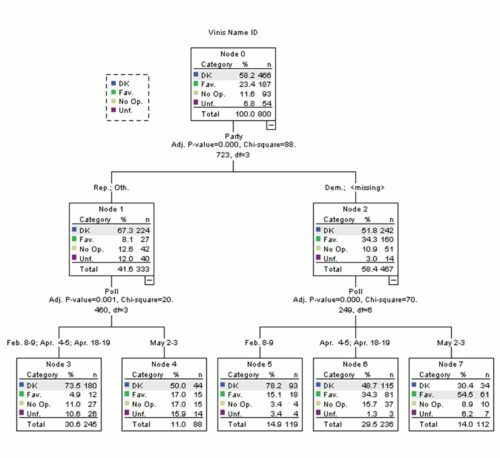 METHODOLOGY: 200 live telephone interviews of City of Eugene likely 2016 Primary voters were conducted on each of February 8-9, April 4-5, April 18-19, and May 2-3, 2016. The margin of error at the sample median for each survey was plus or minus 7%.These were then pooled into a single large sample of 800. The primary driver of support for Mike Clark was a person’s political party. After that, Democrats split up between those from South Eugene and those from the rest of Eugene. Among South Eugene Democrats, Age was the key factor with persons 60 and under being strongly negative. Among the latter, they got to know Clark better, but didn’t much like what they learned. This group was a key part of the business coalition in past years and the loss of this group explains some of the Clark campaign’s troubles. 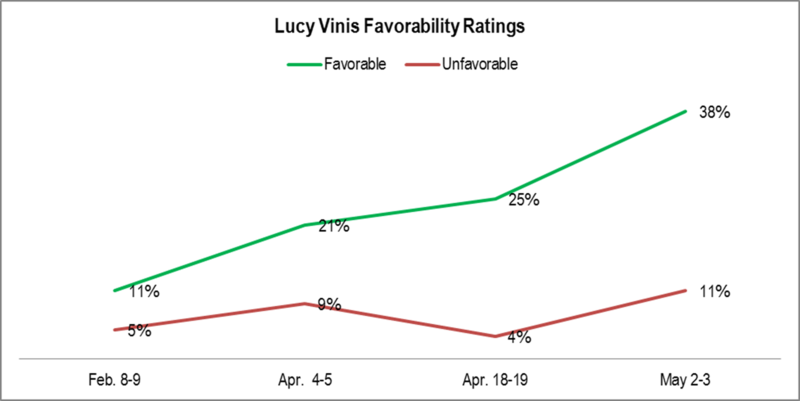 In contrast to Mike Clark’s name familiarity trend (http://lindholmcompanyblog.com/?p=13038), Lucy Vinis’ steadily improved. Her favorables and net favorables increased in every poll. By a couple weeks out her favorable-to-unfavorable ratio was a very healthy three-and-a-half-to-one. 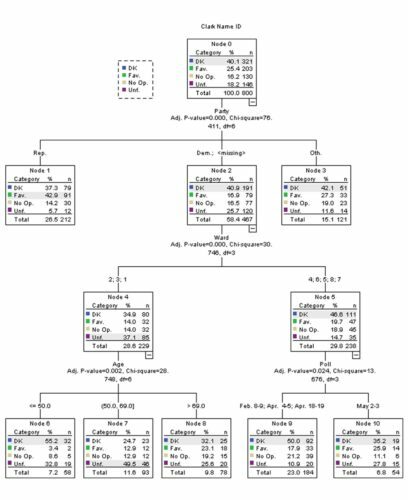 METHODOLOGY: 200 live telephone interviews of City of Eugene likely 2016 Primary voters were conducted on each of February 8-9, April 4-5, April 18-19, and May 2-3, 2016. The margin of error at the sample median for each survey was plus or minus 7%. 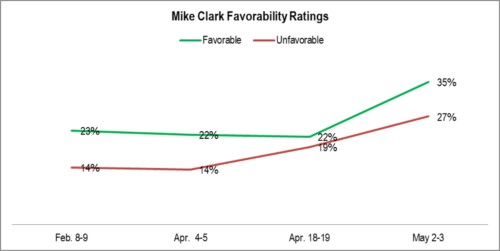 Mike Clark’s net favorability (favorables minus unfavorables) never broke into double digits. A typical campaign goal is two-to-one. At one point Clark was nearly one-to-one. Vinis gained consistently during the campaign. Clark never seemed to gain ground. 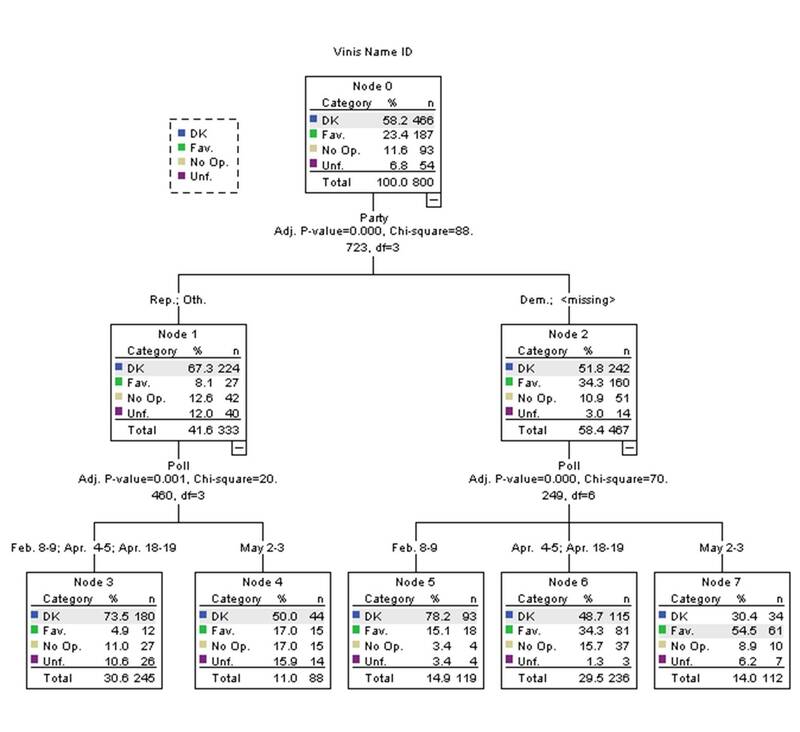 This differences appears to have been a key driver in the final result. Vinis’s name familiarity started very low and gained through the campaign. Clark started high and gained somewhat. His name familiarity remained higher than Vinis’ throughout the campaign. This implies that something else led to Vinis’ victory. Richardson started with a massive lead and never looked back. 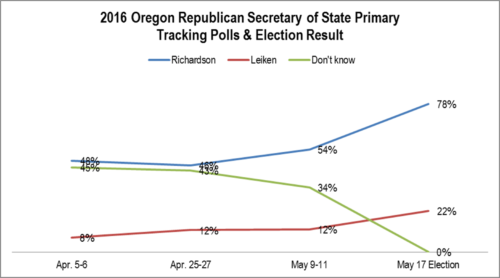 QUESTION: If the Republican Oregon Secretary of State Primary were held today, would you vote for: Dennis Richardson or Sid Leiken? IF DON’T KNOW: Which way do you lean? 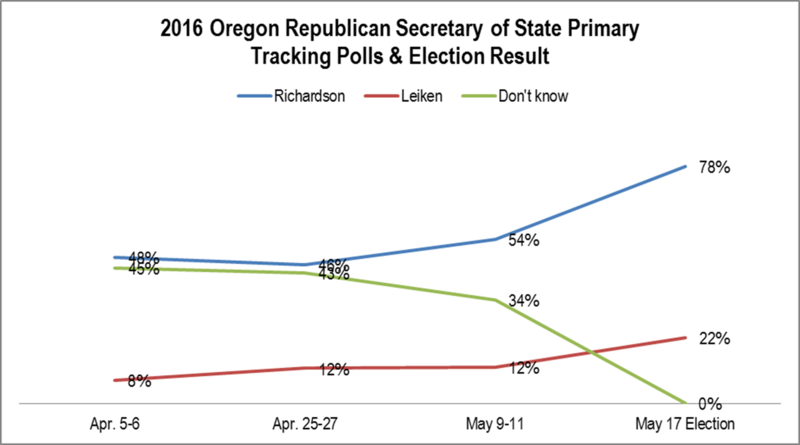 METHODOLOGY: These results are based on three surveys composed of live telephone interviews of likely Oregon Democratic Primary voters. A survey of 200 was conducted April 5-6, 2016. The margin of error at the sample median for this survey is 7%. Two surveys of 400 were conducted April 25-26 and May 9-10, 2016. The margin of error at the sample median for these surveys is 5%. This graphic compares the percentages in City of Eugene precincts that are in the North Eugene County Commissioner district. 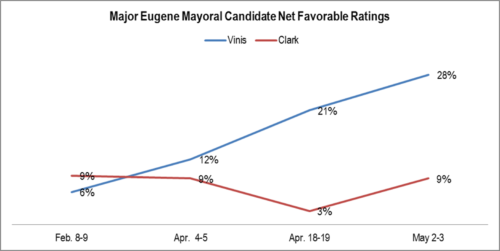 Farr’s percentage equals the Clark percentage plus the other candidates’ percentages plus more than a tenth of Vinis’ percentage. Farr beat Clark by double digits in every precinct where both were on the ballot. Clark’s 53% in these prime precincts was also clearly not enough. Earlier posts showed that he made few if any inroads into the Piercy coalition. This graphic shows he significantly underperformed in among the Torrey coalition. This could actually be worse than it seems. 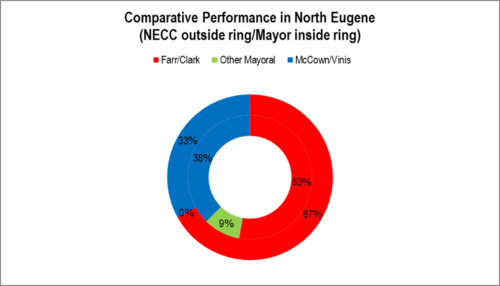 Since Vinis had to win over south Eugene voters while Farr’s opponent, Tony McCown, could create a north-Eugene-specific message, one would expect Clark to receive a higher, not a lower, percentage of the voters than Farr. This pattern has been borne our over time, such as in 2000 and 2008. Disclaimer: Lindholm Company provided in-kind and at-cost materials for the Farr campaign. 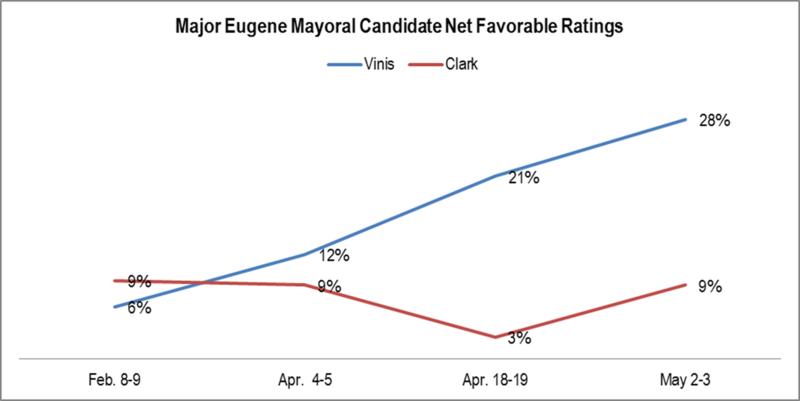 This graphic ranks Lucy Vinis’ net percentage over Mike Clark in the 2016 Mayoral Primary for each of Eugene’s 31 precincts. It is a good way of presenting the geographic concentration of voting. Several things stand out. First, this confirms the result in the last post. Vinis, like Piercy, won by winning big in a relatively small part of the town. 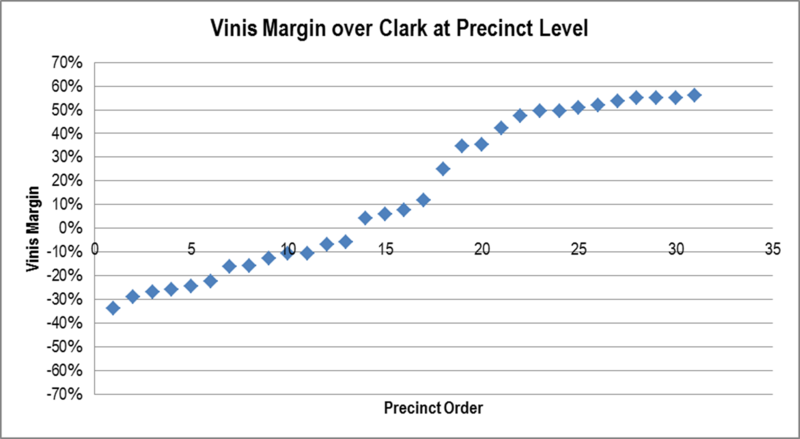 Vinis won a number of precincts by nearly 60% while Clark only won one by more than 30%. Second, rather than a nearly continuous line there is clustering and a break. Ten precincts gave Vinis a margin of 50% or better. On the other hand, less than half a dozen precincts gave her a win by between 0% and 30%. Finally, there is little clustering in the Clark precincts. They form a nice continuous line. It is worth noting that this overstates the margin of Vinis’ win. The precincts Clark won tend to be larger. 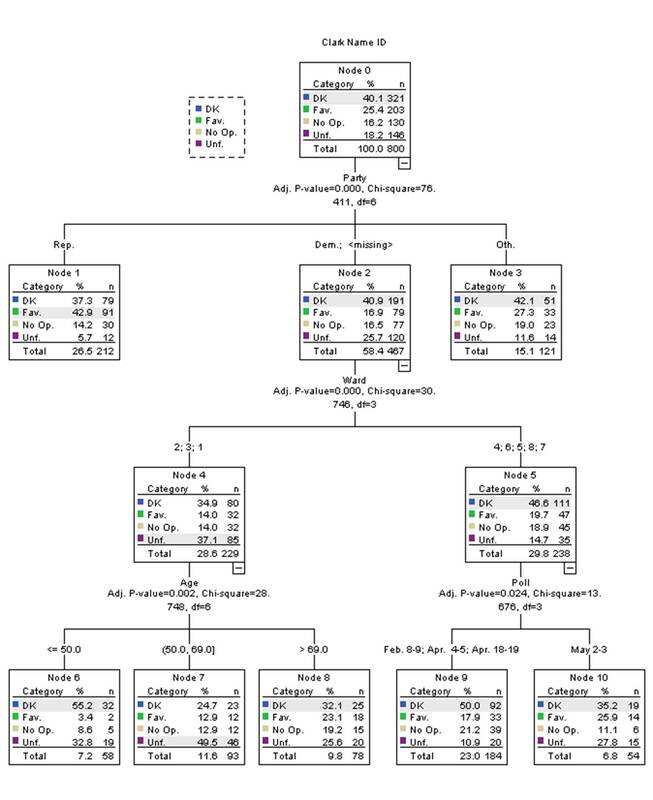 Methodology: The margin equals the Vinis percentage minus the Clark percentage. This post looks at the geographic distribution of the Clark and Vinis votes for Mayor of Eugene in the 2016 Primary. To a large extent, both candidates won where they were expected to win. 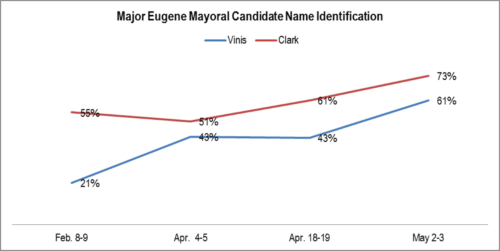 Vinis won in the south Eugene wards (1, 2, and 3; Brown, Taylor, and Zelenka, respectively) and Clark won in the north and west Eugene wards (4, 5, and 6; Poling, Clark, and Evans, respectively). 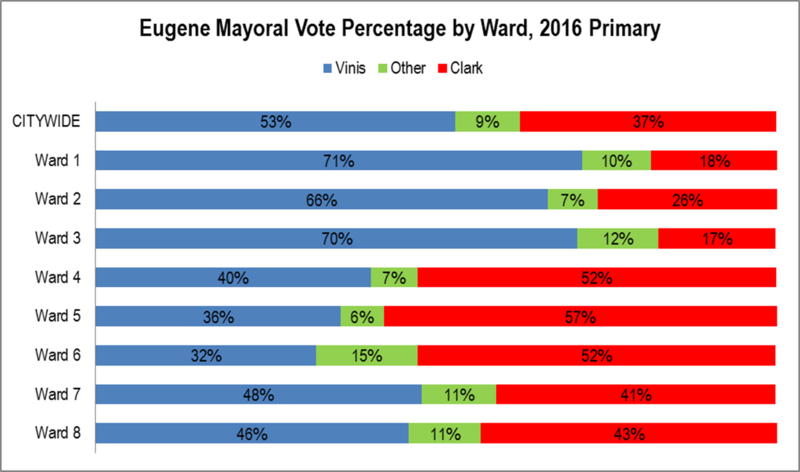 The two remaining west Eugene wards were narrowly won by Vinis: neither candidate received a majority. Ward 8 (Pryor) continues to be the swing ward that any pro-business candidate has to win. Clark did not. Ward 7 (Syrett) is now clearly competitive. This has been appearing for some time. It’s interesting that the Chamber of Commerce chose not to contest this ward. However, all this is not enough to explain Vinis’ wide margin. She did that by winning south Eugene by very wide margins and by keeping Clark’s vote under 60% in all three of his key wards..